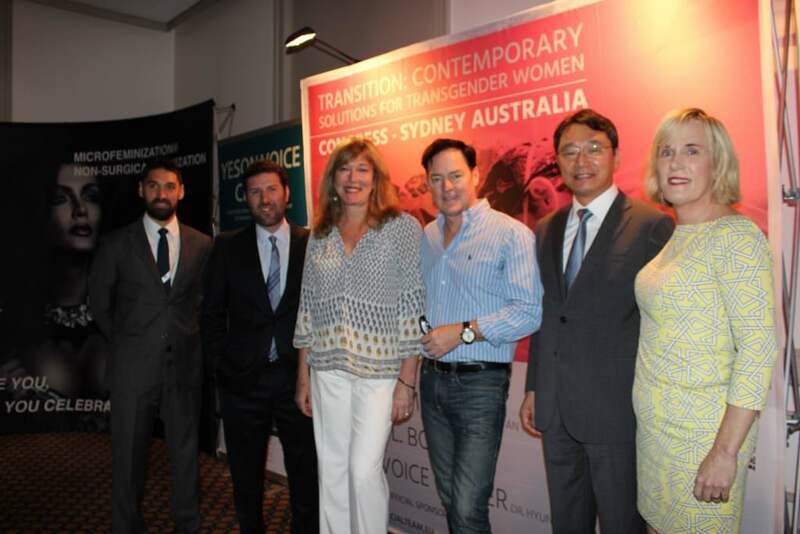 FACIALTEAM brings together some of the world´s best surgical specialists in the field of feminisation in Australia for a unique congress dedicated to the health of transgender women. The second edition of this series of educational events will take place in 3 cities this year in the month of November. 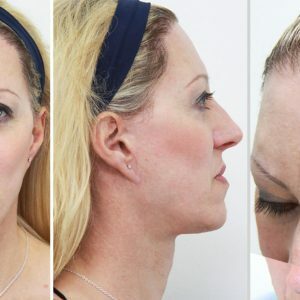 On November 14th, the founders and directors of FACIALTEAM, Dr. Daniel Simon and Dr. Luis Capitán, will be in Perth giving lectures on facial feminisation and providing information about the latest innovations, surgery techniques, what to expect in the postop and share the latest in real FFS surgery results. 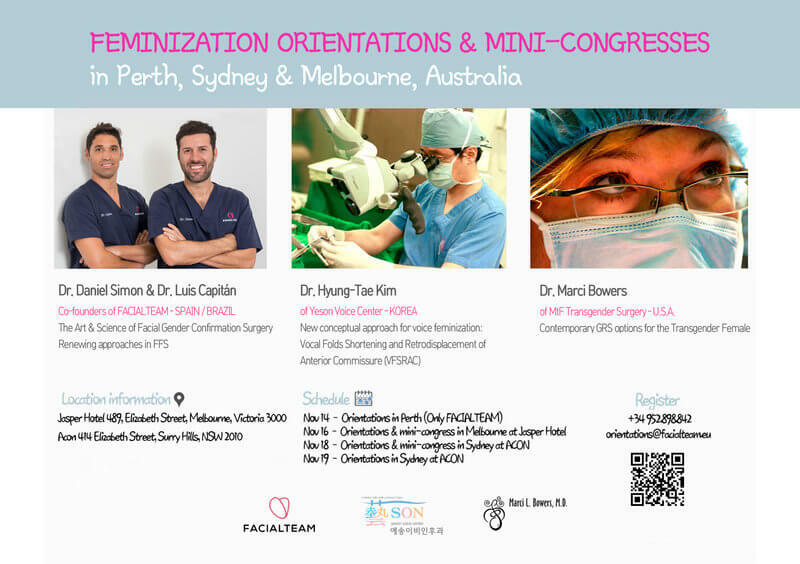 On Thursday, November 16th the team will repeat last year´s successful mini-congress at the Jasper Hotel (Melbourne) and on Saturday, November 18 at ACON (Sydney), alongside informative talks by Dr. Hyung-Tae Kim, specialist in voice feminisation surgery and Dr. Marci Bowers, specialist in gender confirmation surgery. An informative day will be held on Sunday, November 19th also at ACON (Sydney), providing opportunities to delve further into the details in the different fields of feminization surgery. The objective behind a meeting of this magnitude is to disseminate directly from the experts, the most accurate information about surgical options for transgender women. 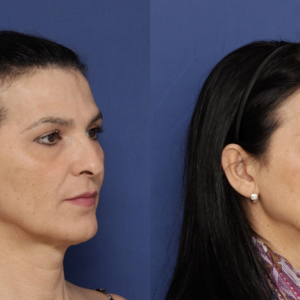 In 2014, Dr. Simon provided the first informational sessions about facial feminization in Australia and, due to the growing demand, the event has been broadened to maximize the experience of the participants by inviting specialists in microfeminisation from Holland, Aprils-ToucH, as well as pioneers in electrolysis, Peach Clinics (local to Sydney). Dr. Hyung-Tae Kim has achieved worldwide recognition for his advances in voice feminisation surgery techniques. His innovative concept focuses on the shortening of the vocal cords and the displacement of the anterior commissure. He is the director of Yeson Voice Center in Korea, where work on diverse vocal problems such as vocal cord paralysis, laryngeal diseases as well as specific programs to feminise the voice. For her part, Dr. Marci Bowers is a gynecologist and surgeon specializing in gender confirmation surgery. She stands out among the few women in the field of surgery who have specialized in vaginoplasty. Her practice is situated in the San Mateo Surgery Center in Burlingame, California and throughout her career has performed more than 400 gender confirmation interventions. She is a respected professional, recognized worldwide for her career achievements as well as many media appearances. Her own life experience has helped her to understand and help patients. Doctors Luis Capitán and Daniel Simon have been at the head of FACIALTEAM for more than 10 years and their extensive experience already includes more than 900 cases of facial feminisation. Throughout the year they offer orientation sessions in different destinations to promote and distribute information about facial feminisation within the process of women’s gender transition. In the 2016 edition, the representatives of these feminisation centers began to give form to the idea of a single event where trans women could obtain a wealth of information on surgeries related to gender transition. Attendees could meet the doctors in person, chat with former patients, freely obtain voice or image tests and pose questions directly to the professionals. Due to the great success of this event, FACIALTEAM has decided to repeat and extend the congress for a second year. One of the rare occasions in which professionals specialized in feminisation techniques come together to make it easier for people considering surgeries to become better informed, but also how best to plan treatments in time. Since a surgical transition can be overwhelming, it is advisable to gather as much information as possible before taking any steps, always seeking advice from multiple professionals. If you are interested in learning more about facial feminisation in Australia, feminisation of the voice or gender confirmation, request your invitation as soon as possible by email: orientations@facialteam.eu or call +34952898842 (Spain). Registration is required and space is limited.